KALININGRAD, Russia -- What passes for Kremlinology at times hits intriguing boundaries due to sheer paucity of information. 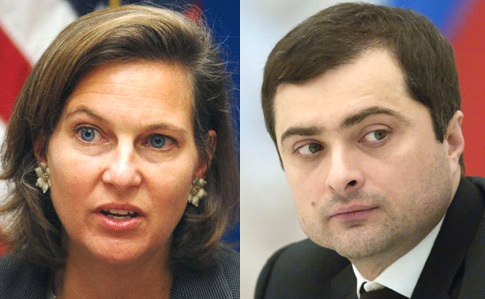 U.S. Assistant Secretary of State Victoria Nuland (L) and Vladislav Surkov, aide of Russian president Vladimir Putin. This happened on Friday when a key Kremlin functionary and presidential aide Vladislav Surkov and the United States Assistant Secretary of State for Eurasia Victoria Nuland met up in the remote north-western Russian enclave of Kaliningrad and clocked several hours of secret conversation. Nuland flew in from Lithuania and left Russian soil immediately after the conversation. There is a surreal touch to it – Moscow sees Nuland as the godmother of the Euromaidan in Kiev in February 2014 and there are pictures of her braving the snow and ice on the city square in the tick of winter distributing sandwiches to protestors seeking the ouster of former President Viktor Yanukovich. Surkov, of course, is often depicted in the West as the ‘grey cardinal’ in Kremlin politics, stands blacklisted for visa under the US sanctions because of his role in the Ukraine conflict. There are two versions of Surkov: one, he was a charioteer of the ‘Novorossiysk’ project to annex eastern Ukraine; and, two, he is actually a ‘westernist’ at heart. Nuland and Surkov huddled together to sort out the mess in Ukraine. “The discussions we had were detailed enough, fruitful and useful. This is brainstorming of a kind to tap compromise solutions. Ideas were voiced on some extremely sensitive issues like the constitutional reform (in Ukraine), security and elections. They can now be discussed at the Contact Group (in charge of settling the armed conflict in Donbass region of eastern Ukraine) or in the Normandy format (Russia, Germany, France, and Ukraine)”. Surkov could have given the positive spin only with tacit approval from the Kremlin. So, are things moving in the right direction towards settlement in Ukraine in 2016? Surkov is identified with the Kremlin push to ‘de-escalate’ in eastern Ukraine. The western (and Russian) pundits also argue that two key appointments Putin recently made suggest that the Kremlin is pushing for conflict resolution – Boris Gryzlov as Russia’s new representative in the Trilateral Contact Group on Ukraine and Dmitri Kozak, deputy prime minister (known trouble shooter in ‘hot spots’ such as North Caucasus or Crimea) as Moscow’s new point person for eastern Ukraine. Gryzlov is a political heavyweight who holds the powerful position as permanent member of Russia’s Security Council and he used to be minister of interior and speaker of State Duma, apart from being a colleague from Putin’s St. Petersburg days in the KGB. Gryzlov’s presence in the Trilateral Contact Group (which is entrusted with implementation of the Minsk Agreement) literally electrifies the body. Andres Aslund at the Atlantic Council assesses that these two Kremlin appointments would signify a shift in Russian policies on Ukraine and hint at Moscow’s interest to negotiate a deal. He wrote, “The transition to Kozak and Gryzlov is undoubtedly an important milestone. Kozak’s appointment indicates that Russia has concluded its active military phase… The appointment of Gryzlov is more curious. He represented Putin in the roundtable negotiation that led to the settlement of the Orange Revolution (in Ukraine) with repeat elections in December 2004. If Putin authorized Gryzlov to make substantial concessions to Ukraine then, he might be ready to do so again”. Aslund is of course a harsh critic of the Kremlin policies and, unsurprisingly, he attributes this to the recession in Russian economy compelling Moscow to compromise. But the thesis doesn’t gel with Russia’s revised National Security Strategy for 2016, approved by Putin on December 3, which singles out ‘color revolutions’ and NATO expansion as key threats to Russia’s security. However, a denouement in Ukraine could be struggling to be born. The overarching reality is that there are no ‘winners’ in Ukraine. The US brilliantly succeeded in putting a pro-western leadership in power in Kiev two years ago, but it turned out to be a Pyrrhic victory. Writing in Foreign Affairs magazine recently, Taras Kuzio, one of the West’s leading experts on Ukraine, pointed out that the pro-western leadership in Kiev is widely unpopular across the country and its rating stands below that of the Yanukovich regime it replaced. The economy is in shambles, corruption and venality have become rampant, leadership in Kiev is testy and the country is becoming chaotic. If these reforms do not happen, Poroshenko could be overthrown in a country that is now awash with weapons and more tolerant of political violence”. A ‘revolution in revolution’ – to borrow the famous words of French philosopher Regis Debray – in the heart of Eurasia? Indeed, a revolutionary legacy would be the last thing the Obama administration would have expected when it pushed through regime change in Ukraine. The backdrop is ominous, too. “The decades when we thought of Europe as stable, predictable and dull are over. The continent’s map is becoming medieval again, if not yet in its boundaries then at least in its political attitudes and allegiances”. From such a perspective, it makes sense that Obama directed Nuland to do some ‘brainstorming’ with none other than Surkov to probe Putin’s manifest desire to bury Russia’s standoff with the West over Ukraine. Meanwhile, Gryzlov travelled to Kiev on Wednesday to meet Poroshenko. Again, the special envoys of German Chancellor Angela Merkel and French President Francois Hollande are visiting Kiev on Monday to press Poroshenko to implement Minsk agreement on full ceasefire. Ukraine issue also brings together US Secretary of State John Kerry and his Russian counterpart Sergey Lavrov for a meeting in Zurich coming Wednesday. The weekend’s ‘brainstorming’ at Kaliningrad was both symbolic and meaningful. Obama’s phone call to Putin a day earlier would have set its tempo.